The Each Way Calculator is an extremely useful tool to determine the ideal lay stakes for Each Way bets and Extra Place offers. Many bookmakers run promotions where they offer additional places on selected races. By doing so, it is often possible to lock in a profit simply by laying the win part and place part of your each way bet. You may also wish to simply lay a standard each way bet or have found an each way arb opportunity. 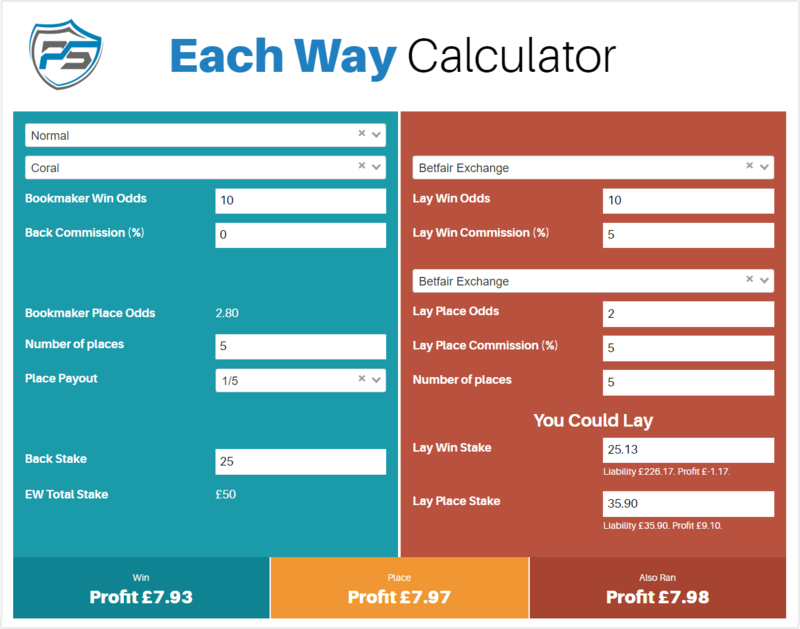 The Each Way Calculator from Profit Squad makes calculating the lay stakes for these bets quick and easy. An each way bet consists of two separate bets totalling one single stake. A win bet and a place bet. Each way bets are most common in horse racing but can be used in other sports with multiple participants such as Golf. If we placed a £10 each way bet on a horse, half of our stake would be placed on the horse to win and half on the horse to finish in one of the place positions.If the horse wins, you win both your bets, if the horse finishes in one of the place positions, only your place bet would win and if the horse finishes outside of the place positions, both your bets would lose. The number of place positions is set by the individual bookmaker for each race and usually depends on how many horses are running. To lay an each way bet, you must lay both the win part of the bet and the lay part separately. Thankfully, the Each Way Calculator makes calculating the ideal lay stakes a breeze. Mug betting – Placing each way bets makes you seem like a more natural punter. Use the each way calculator to determine your lay stakes for minimal qualifying losses. Free Bets & Bonuses – Use your free bets or bonuses on each way bets. Again, you will seem less like a matched bettor and more like a regular punter. You may also return a higher profit from your free bets in some instances and may also qualify for extra place offers. Extra Place Offers – Adjust the settings on the calculator to reflect the number of additiona lplaces a bookmaker is offering. These provide you with additional value and you may be able to return a profit with little to no risk. By entering details of your each way bet, the Each Way calculator will automatically calculate the ideal lay stakes to return the greatest profit or lowest qualifying loss regardless of the result of your bet. A bookmaker is paying out on 6 places rather than the standard 4 on a horse race. We then input these details into the each way calculator along with our stake, the lay odds on the exchange and the additional places the bookmaker is paying out on. As you can see, from just a £10 stake, we would stand to make £29.22 profit if our horse finishes in the extra places (5th or 6th) and a minimal loss if it didn’t. Therefore, for a relatively small risk, you have the chance to make a significant profit. You won’t win every time from extra place offers but they can be very good value and return a good profit on average over time.